Recently, I spent an evening in Barcelona having dinner with a group of advertising executives, talking to them how VR was evolving and what it meant for their business. This was a wildly valuable experience for two primary reasons, both of which went far beyond the facts that a) I was in Barcelona, which even in late-February “wintry mix” is basically magical, b) it was also my birthday, and c) everyone at the dinner was British and so was hilarious in either a Hugh Laurie way or a Shannon Horgan way while still being generous enough to sing “Happy Birthday” with both sincerity and gusto. Oh, and d) profiteroles. The first of the two reasons is that the dinner was my first opportunity to unpack some of the ideas from my book in a way that helped get them into the world. Up until then, Future Presence had only coalesced into two shapes in my brain, each of which resided at a different far-flung end of the micro-macro continuum. If someone asked me about the book, I’d either describe it in a sentence (“it’s about VR’s ability to create intimacy, and what that means for human relationships”), or I’d hand them a 250-page manuscript. That was fine, but both were extremes; if I was talking about astronomy instead of VR, it was like choosing between telling a person the name of every star in the night sky or just leaning in close to them and yelling “SPACE!” Instead, I needed to talk to people not about stars, but about constellations—constellations they could then point out to their friends. So the book, for lack of a better term, finally started to turn into a package, into a series of concepts that could expand or contract depending on the time frame and the listener. The cynical term for this, I guess, is “talking points,” though in reality (and much to my delight) they became more like asking points. I’d prefaced my remarks by urging people to ask questions, and they did—and their curiosity turned what could have been just some speech to a spontaneous and wide-ranging conversation. We talked about the way VR changes interactions, about how different forms of presence create increasingly more intense emotional and even physical experiences, and about how the next year or two will move beyond some of the technological constraints of this first generation of VR headsets. What struck me about the questions, however, was how they all fell pretty decidedly into “dystopia” territory. On one hand, that’s not out of the ordinary. Whenever I talk to people about VR, there are always questions about the dangers of such an immersive (and potentially escapist) technology. But this time, people kept pointing to the same reference point: Black Mirror. 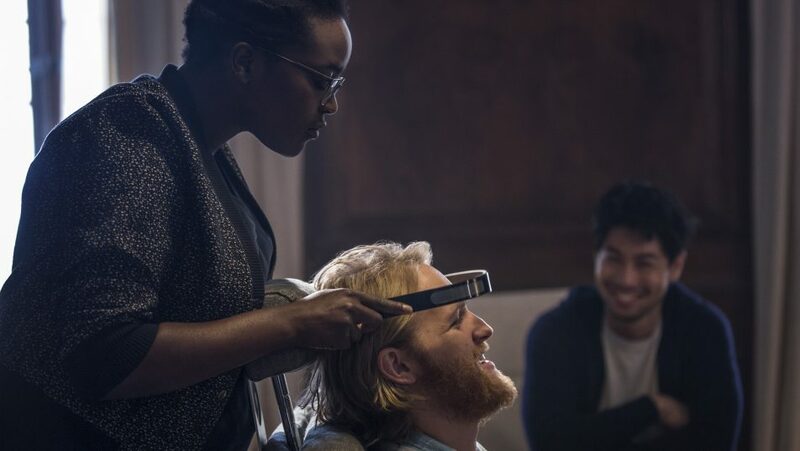 Sometimes it was the “San Junipero” episode, in which an elderly woman used an advanced form of VR to relive a relationship from earlier in her life; other times it was “Playtest,” in which a gamer is unaware, Matrix-style, that what he’s experiencing isn’t real at all. Both of those episodes (along with Charlie Brooker’s series as a whole) speak to legitimate concerns about a technology that could one day change the way we accept the veracity of our surroundings. Yet, the tonal consistency of the questions underscored more than anything else that the way we think about technology has changed. Fundamentally. We’ve moved from imagining innovation as an agent of positive change to thinking of it as something that can be misused—that invariably will be misused. How could we not? Look what happened with the internet. We’re besieged every day with news of having our personal data stolen, of being lied to, of tragedies motivated by utter lack of empathy. Platforms are struggling to stem a toxicity enabled by their own myopia. There’s little reason to think that VR and AR won’t bring the same challenges—or that those challenges won’t be catastrophically worse. Except for this: the people creating VR and AR have seen this movie before, and they have no desire for a sequel. They’re already building user-safety tools into today’s infant multiuser platforms. They’re putting a premium on authentication and verification—ideas that might have come in handy for Twitter and YouTube a few years ago. And most importantly, they’re determined to combat bad actors who can. Will that be enough? Honestly, I don’t think so; given what we saw with the internet, and what VR/AR enable, a concept like verifying an experience is going to need some sort of regulatory or legislative power behind it. But the earlier we think about the Black Mirror outcomes, and the earlier we talk about them, the better chance we have of preventing them—and keeping those mirrors clean and clear.